First, let’s start with what this problem tells us. We are given an arc with an angle of 30° and the length of 4π. We are being asked to find the area. When it comes to geometry on the SAT, they only test you on basic shapes. Knowing that, what’s important to realize here is that this arc is part of a circle. 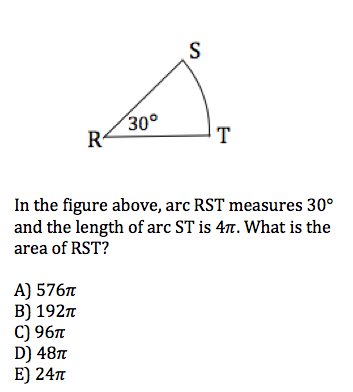 If I can figure out what part of the whole circle this arc is, I can try and solve for the area of the circle and from there get to the area of RST. A circle is 360°, and we have a slice that has 30°. How many times can we fit the 30° slice in the 360°? If we divide 360 by 30, we find that we can fit it 12 times. This tells me that the arc given is 1 piece out of a total of 12 pieces. 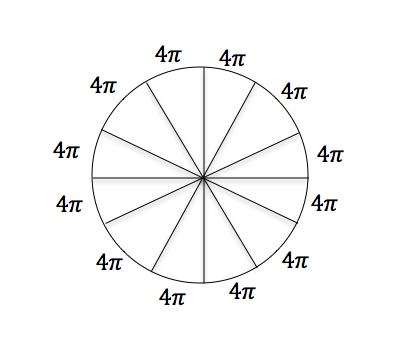 Now if the length of arc ST is 4π, and there are 12 pieces that make up the complete circle, I can do 12 * 4π to figure out the CIRCUMFERENCE of the circle which will be 48π. At this point, I know that the CIRCUMFERENCE of the circle is 48π. 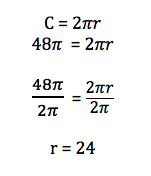 I can set 48π equal to the CIRCUMFERENCE formula to find the radius of the circle. If the area of the whole circle is 576π and the arc represents 1 out of 12 pieces, I can divide the 576π by 12 to get the area of RST.